What does that little sticker mean to you? Wow, another sticker on the back of a dirty bumper. For your sake I'm glad you are giving these away because if you were trying to make a living selling them, you would starve to death. I guess that first anonymous commenter has a point. 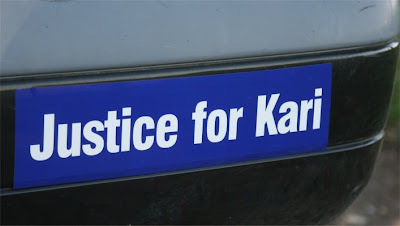 What can a blue "Justice for Kari" bumper sticker on a dirty bumper do? 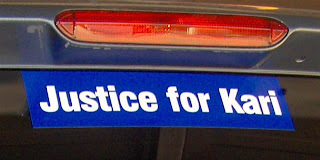 I want to say it speaks for Kari, but there are many things that the sticker on my bumper cannot say. It can't tell two sweet girls how much their mother loved them. Nor can it tell them that having known how much it hurts to lose a precious loved one, Kari would never have left them on purpose. It can't tell us what really happened on the night of April 7 two years ago. It can't say why Kari thought her husband was having an affair or why she thought he might want to kill her. That sticker can't explain why Matt's recent descriptions of Kari's character and mental health are completely contradictory to what others who knew her saw with their own eyes. That sticker cannot explain why there are so many documented accusations of sexual misconduct in Matt Baker's past or why he was never held accountable for any of them. That sticker can't ask Matt why the only friend he could find to comfort him in his "grief" over the loss of "the love of his life" was a young recently divorced woman who he was supposed to be ministering to. Where were all his guy friends? Did he have any? No, that bumper sticker can't tell us what happened to the computers, the printer, or the crushed pills. It cannot explain why a loving father would put his girls in the middle of publicity storm or malign the character of their mother. It can't tell the Dulins "Thanks for never giving up on me. Thanks for asking hard questions and seeking the truth for me, no matter what the cost to you," as I believe Kari would. That sticker can’t bring Kari back to her Mom. However, that bumper sticker speaks volumes. It tells the Dulins that they are not alone. In a very public way it says, “I believe that justice is still possible.” It tells a community that there is unfinished business that will not be forgotten. It begs a DA to do his job and seek justice for one who is no longer able to seek it for herself. It warns those who think they can get away with evil that there are good people who will fight for justice just because it is the right thing to do. 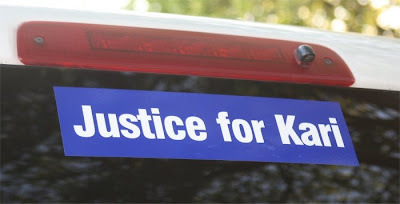 That bumper sticker was not made to create financial gain.It was made to ask those who can to please do all that is within their power to bring this case to trial and let justice prevail. 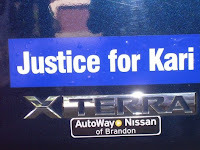 I consider that blue bumper sticker to be a badge of honor and it will stay on my dirty mini-van’s bumper until we finally have JUSTICE FOR KARI! This needs a HECK YEAH, or an AMEN or BOTH! Thank you SG. The following comment was received under the "Another" post this morning. I wanted to bring it out in a post so that it wouldn't get missed. The Dulins will NEVER give up. They fight for the welfare of two little girls who have been heartlessly told that their mother did not love them as much as she loved their little sister. They fight because the TRUTH must be told, and ultimately, those girls will have to know it. Kensi and Grace need to know their mother did not choose to leave them! The Dulins see the pursuit of that truth as the final thing they can do for Kari--a continued and unequivocal committment to the children she loved and adored and would never have abandoned. NEVER. Contrary to the hateful remarks Matt and his mother have made in the press, Kari's parents are not vengeful people. They are calm, soft-spoken, generous--and very, very smart. They absolutely love their grandchildren more than anything, and they are rightly concerned for their well-being and mental health. They DO NOT disparage Matt to those little girls, regardless of statements to the contrary by the Bakers. They fully understand that those children love their dad and believe in his innocence, and they do not attempt to take that belief from them by discussing the case in their presence. Not ever. Sadly, Matt and his mother do not respect the girls enough to allow them to love and be loved by Linda and Jim without guilt attached. Just read the remarks those two have made to the media, and that point becomes painfully obvious. There is no apparent effort to shield the girls from publicity, either. On the contrary, they are used as "props" when the pity-seeking father gives interviews. I have been in the Dulin's company many times, and they have never once spoken of wanting vengeance. They pursue justice in the courts because they have put together enough information from a myriad of sources that speaks loudly of Matt's guilt. It cannot be ignored, and evidence continues to grow as the investigation gains momentum. No, you have no need to worry, Anonymous Poster. The Dulins will not be leaving the fight. 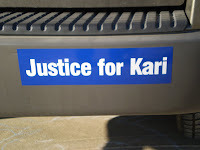 They will always seek justice for Kari, and we can pray that it comes soon. Hello, While I never knew Kari I do know her mother. My heart just aches for her loss and truthfully I don’t know how she continues. But I know she does so that she can offer strength and love for those left behind, especially for Kari’s children. My mother and I both are proudly declaring our support for Kari and her family. May justice be the end result! Thanks so much! I know it's sometimes hard to get these pics to me but I really appreciate those of you that have been able to do so. I've had several people say they are starting to see them out and about...including someone from the Waco Trib. The word of this support is getting more and more obvious. So, are we to believe that the problem wasn’t lack of evidence — it was that they didn’t investigate? Never mind that the arrest affidavit and other media sources substantiate that Baker’s story is full of incongruencies. 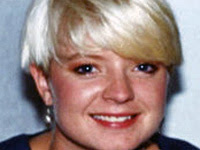 Who cares that the forensics evidence, stolen computer and Internet searches all add more suspicions surrounding this death? The district attorney’s office must respond to crimes in a vigorous and timely manner. I am glad Kari’s kin have a civil option in this case. And it is fortunate there is no statute of limitations on murder. We need a DA who fights for victims. I hope someone will run against Segrest when it’s time for re-election. Three more pics sent in. Thanks, guys. Let me know if you want more. The wonderful woman who ordered these is looking forward to "needing" to order another box. * I gave 3 stickers to one person over the weekend and she made the joke that between her vehicle and the friends she gave the others to, that they all had vehicles way similar in color. And thanks to those who sent SASE's last week. I got a bunch out yesterday to the post office....they'll go out in the first load early afternoon. I'll bring you 10 more tomorrow. 3 more pictures sent to me today. Thanks!! I had a request for 10 stickers yesterday, dropped 1 off down the street a few minutes ago, dropping 12-15 off at a church tomorrow and meeting 3 friends while out to give them theirs....oh, and mailed 1 yesterday and 2 today. Kim is another friend of Kari's and fellow teacher from Spring Valley at the time Kari was there. I noticed she recently posted on her blog about last week being the 2 year anniversary of Kari's death. She also commented here about being at the cemetery at the very time that I was there looking for Kari and just as Kari's parents were leaving....and all of us just missing each other. Moving on....after everything and the roller coaster of emotions relating to the events of Kari's death, I have come to the point where I think can move on. So much so that I purchased a new Bible to replace the one I can't find. Jamie and I are going to dinner with the pastor and his wife of the church where we are members. Maybe by summer, we will be back at church." The actions of that day touched more people than Matt could ever realize. Countless people knew and loved Kari. Countless people grieved so hard that it was difficult to move sometimes in the following days. Countless people still miss Kari. And countless, countless, countless people know Kari and know that she did not take her own life. And soon the remaining few that are hell bent on Matt's innocence will know the truth as well. And I pray for everyone involved. Prayers for strength for Kari's family to keep on keeping on and prayers for Matt's family when it's time to face the truth. A couple of weeks ago I asked Kari's family if it would be okay if I ordered some bumper stickers or something......Found out a sweet friend of the family was already on it. THANK YOU! 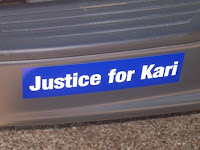 If you would like "JUSTICE FOR KARI," just let me know. I have been given a P.O.Box address that you can send a self-addressed-stamped-envelope to and they will quickly send you your own sticker.....to be displayed prominently wherever you choose. Let me just say....these are cool stickers. They are "Zip-Strips" which are self-adhesive AND removable. Trust me....took me a few times to get it straight tonight and it was very easy to take off and re-affix. It will be folded in half, but it should come out fine. Also, if you see me out and about, I will keep some in my vehicle and you can get them from me. Two sweet memories were left today that I would like to highlight. My name is Tina Turk Billiet and I went to High School with Kari her freshman and sophomore years in Gatesville. Kari and I went to church together as well. My father was her pastor. I have many memories of Kari and all of them are of how enegetic and fun she was. I, as well as everyone who has written their memory, also feel very strongly that her death was not by her own hand. It's just a feeling but a very strong one at that. The memory i have to share is one that involved a youth trip that we took with our church. There were only a couple of us that went on this trip, and that's what made it so fun. We ended up staying in the fellowship hall of a church in Ft. Worth, Tx. It was just for the weekend. Our youth pastor's father was a pastorof this church. The fellowship hall led into the huge sanctuary and we had access to it. One night we were soooo bored that we decided to go exploring. The sunday school rooms were in a basement underneath the sanctuary. The building was built pretty interesting. Well, as you can imagine the entire place was completely dark. We couldn't even see our own hands in front of our faces. After we explored the basement, we ended up in the sanctuary. And that was dark as well. However, we did have the advantage of the red glowing exit's signs on either side of the platform. We decided that it would be a great idea if we all played hide and seek. No we were not babies but I know I felt like one after a couple of minutes of playing the game. Yes, I was a complete wimp. There were only 2 guys with us and the rest were girls, Kari included. Now, if you have ever played this kind of game in a dark sanctuary then you know how scary it could be, especially with 2 guys determined to scare the complete devil out of you. I destincly remember hiding under the sound board for the sound system of the church. This was in the balcony. Yes, this church was that big. Like I said it was in Ft. Worth. With me under the sound board was Kari and another girl that was with us. We were all squashed in there like sardine's and we were all completely soaked with sweat. You really get to know someone real well in that kind situation. All 3 of us did not care because we all had the mind set of not getting caught by one of the guys. That was there mission of course and we were determined not to let them get the best of us. We all know that it's always girls against boys, especially during that time of our lives. I can't remember exactly who won the game but i do remember the 3 of us trying to communicate to one another through sign language. We were trying so hard not to talk and that was very hard for us. Kari kept laughing and it seemed very hard for her to keep quiet. I kept trying to keep her quiet because I did not want to get the you know what scared out of me and I did not want to let the guys win. They had a way of gloating about it when they did get us. this memory was not neccessarily spectacular but it is a memory. And now, more than ever I am very glad I have it. I have read most of the memories on this web site and I am so thrilled that Kari has touched so many lives. She was a very special and beautiful person. 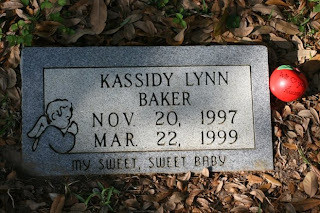 When I last saw her, it was my 10 year high school reunion in Gatesville, at a football game. There were tons of people around and I didn't even see her. The next thing I know my name was being yelled and when I turned around I saw her. I went over to hug her and be introduced to Matt and her oldest daughter. Her daughter was about 2 at the time. I remember this very well because she was literally crawling all over Kari. We started a conversation up and it involved Kari telling me that I was wasting my time on a guy I was dating that we both knew. Looking back, I never dreamed that my last conversation with her would be of her counseling me about some guy. I wish I could go back and replay that conversation and learn more about her life as it was. But in life, we don't get those opportunities. And in hindsight, we wish we could go back. Kari was your basic enthusiastic, beautiful, encouraging, life loving, devoted and inspiring friend. I feel very blessed to have kinown her, as well as I look forward to seeing her again some day. It breaks my heart to know the kind of pain that she suffered. She never deserved any of it. However, I take comfort in knowing that she is not suffering now. She is now with the one and only man who always loved her so completely and so purely. She is now with Jesus Christ and I know without a doubt that He is holding her close. There is no pain for her now. There is only peace and love, something we all need in this life. And something we, who are left behind, can hold onto. 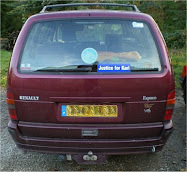 I do hope justice is served, mainly for Kari's girls sake and for Kari's family. bless you and give you strength. Know that you will meet again in a better place. For now, you guys stick together and know you are so deeply loved. I found her spot. I sat the flowers to the left of her headstone and then I just sat down on the other side for a while. No words. Didn't need any. None seemed enough really. So I just sat "with her." I tried to fight the tears back...but that was a futile attempt. I've never been one to necessarily go to visit at the graves of loved ones on a regular basis. I know they are not "there." But this felt right. If anyone needs directions, feel free to email me for them. I thought I could find it. I have never been there exactly. We got there too late to ask the office for the location. 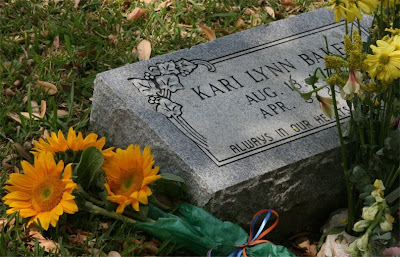 It was just as I was heading to get my daughter from school that I realized I really wanted to go leave something at Kari's grave. She'd been on my mind so much yesterday. I figured we'd get home and wait for Bro to get off the bus and then we'd drive in to the teacher stores and get some sort of "teacher gift" that we could leave. Apple...ruler...something. In a hurry, we found a little apple and borrowed a Sharpie from the lady at the store to write on it. And we headed to Oakwood. Since we were too late and the office was closed, we first went to the precious baby area....unfortunately through a couple friends, I knew where that was. I quickly found Kassidy. My daughter was asleep in the car but Brody and I looked around close by in case there was a "lucky" opening close by when Kari was laid to rest. Nope. Drove a bit to newer areas. Really had no clue. We meandered. We appreciate cemeteries....we tend to linger when we go...reading headstones and talking about who we find and just how beautiful and touching some graves are. We drove a bit more and then, of course.....one kid had to go potty. Quickly. @@ Well, as big as Oakwood is and it being a school night and well, our impending urgent need to get going, I decided to drive back to Kassidy and leave "Kari's apple" with her. I took a quick snapshot in case it blew away or was stolen in the night. After we got home, I emailed Kari's Mom to ask for directions to Kari's grave for future reference and to let her know I was there. She tells me exactly how to get there.....in a such a quiet detailed way....like a Mother making her way to her daughter. Then she tells me she was also there today to leave flowers for Kari and Kassidy. Turns out....we were there at the exact same time....just passing each other and not even knowing it. Received a comment on this post and I wanted to include it here so it wouldn't get overlooked. I was there too! We all missed each other. I had a hard time remembering where to find Kari. I had gotten out once and my son and I looked. When we couldn't find her we drove around some more eventually ending up where I thought she should be and called Linda. She said they had just left and Jim told me what to look for. Turns out we were right there both times, just didn't go far enough in. I wondered if I would be the only friend who would stop by to visit. It is nice to know I wasn't. I fixed the flowers that had falled over and prayed with Kari as we had done so many times before she died. My son, bless his heart, even walked away saying "I'll give you some alone time with your friend. Two years is a long time." I kneeled by her side and just sat peacefully. 2 years ago today, Kari was waking up and getting her girls ready for school. She was getting herself ready for a job interview she was looking forward to so much. She was looking forward to a family get together that weekend that she helped plan in celebration of a family member getting a good cancer report. 2 years ago today, it seemed like "just another T.G.I.F." We just didn't realize it would be the last day on earth we'd have Kari to see, work beside, hug, wave to, walk down the hall with, chuckle with, be taught by, eat lunch with, talk on the phone to, run into shopping.....and to tell her we loved her. But someone saw to it that it was. Today, Kari lives in a place of perfect peace and perfect love. And it is left to those of us still living on this imperfect world below to fight for her justice and for the truth to be revealed......for her daughters' sakes. They deserve to be surrounded by people that don't have to "struggle to remember the good" about their Mom. They deserve to know and remember their Mom the way she really was - that she loved them more than anything - and that she did not leave them of her own doing. They should be surrounded by people that have funny stories, crazy memories and that know the lessons Kari taught about strength of character and love of God. They should be encouraged and lifted up by their Mother's life. They should have the pictures of themselves hugging and laughing with their Mom. They should have their Mom, period. The next best thing we can give them is the truth about their Mom.....and how much she loved and adored them. Lacking evidence? What has justice come to in the United States? I’m not talking about Guantanamo or O.J. I’m talking about justice in Waco, Texas. Consider the McLennan County DA’s office — specifically John Segrest — and its ineptitude regarding the Matt Baker case. “Lacking evidence”? Perhaps the Trib headline should read “DA lacking effort.” Just hope that as long as you live in McLennan County and Segrest is in office your family doesn’t suffer from a violent crime.McLennan County voters won’t forget this abdication of responsibility when it’s time to vote. **I believe now the DA's office is investigating finally. There is time to turn this travesty around. Keep the prayers up. I've enjoyed your blog for several months now. You're doing a great job of keeping people informed and mediating the wide variety of comments you get. I read with interest the comments about how many Kerrville folks support Matt. I live in Kerrville and have met Matt. My kids know his kids from school. Please do not assume that we all blindly think he is innocent. The majority of the people I know think that there is a very good chance that he did indeed do what he has been accused of. Even many people who grew up with him or knew him as a child. And I hate how this might hurt Matt's parents. They are actually very nice, very decent people. I just wanted to let it be known that just because we live in Kerrville does not mean that we necessarily believe in Matt's innocence. Keep up the great work! Yes, I know this can't possibly be how every person in Kerrville feels, but I think it is important to give these folks a chance to let their feelings be known.